Full reporting might then count between 1 million, 650 thousand and almost 3 million organisms, the great majority of them yellow tangs! Even with wise management this is an enormous take in a limited fishery. There is only one way, other than further restricting collection, for us to ensure the availability of beautiful reef fishes for our aquaria. We must support those engaged in captive breeding programs and other aquaculture techniques. This may very well entail the willingness to pay more for our acquisitions. Of course much has been done. In the July 2003 issue of AAOM I interviewed Dr. Dale Sarver and Neil Simms of Kona Blue Water Farms at the Natural Energy Laboratories of Hawaii Authority (NELHA). They successfully bred and raised the highly popular Flame Angelfish as part of a research project on foods for larval stage hatchlings and are capable of producing them in commercial quantities for the aquarium trade. Since that time they have abandoned the project. As they thought, they could not compete with the price of wild-caught fishes. This is a great loss and an ethical stain on our hobby. The issue is not just to request aquacultured organisms from your LFS or even to actively encourage them to provide such stock, BUT TO SHOW YOUR COMMITMENT BY BEING WILLING TO PAY A PREMIUM PRICE FOR THESE SPECIMENS. We will have another chance. The front page story in West Hawaii Today of July 26, 2005 reads “Marine biologist receives grants to raise reef fish.” Carolyn Lucas reports that expert marine hatchery biologist Syd Kraul, owner of Pacific Planktonics at the Natural Energy Laboratory here, is researching ways to successfully produce high value ornamental reef fish in captivity for the aquarium industry. Estimates are that the market has a potential annual worth up to $15 billion worldwide. She further reports that Syd Kraul plans to raise yellow tang, butterfly fish, angelfish and wrasses — fish that have not been cultivated before, or have only been bred in small numbers. He has been awarded a $78,150 Hawaii Department of Agriculture grant and a $21,281 Small Business Innovation Research Matching Grant from The Hawaii High Technology Development Corp. Kraul’s intent is to develop new production methods so that he can lower the costs for farming these fish. 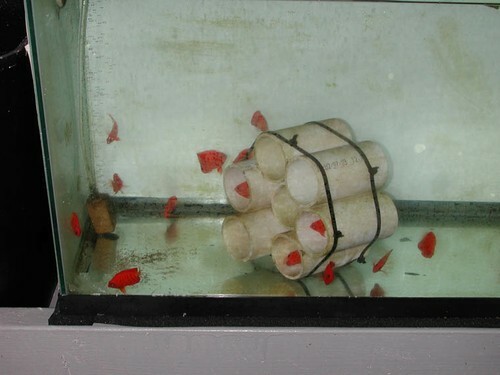 Kraul also reminds us that some of the methods used to capture fish harm the reef. In the Philippines and Indonesia, divers have been known to use sodium cyanide solutions to stun the fish. In the process, they can kill coral and damage the reef environment. In the United States, about 5.6 million marine tropical fish are held in approximately 1.1 million aquaria. 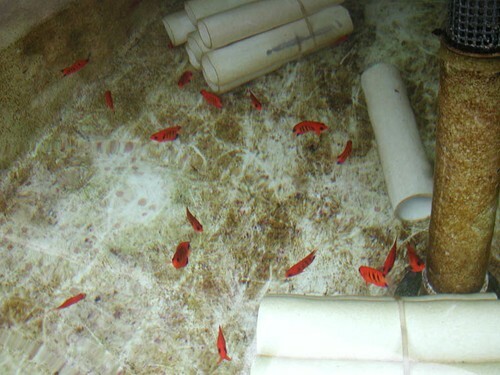 With an estimated value of $400-500 per pound, entrepreneurs have attempted the aquaculture of ornamental fishes since the mid-1970s, but have been severely limited by technology and have been successful with only a limited variety of species. Pacific Planktonics is focusing on the nutrition requirements of broodstock — what they need to eat to continue spawning and maximizing the quality of the eggs and larvae produced. He suspects reef fish will survive better when Euplotes ciliates are used as a first feed for reef fish larvae. In order to determine this, he will compare the nutritional values of ciliates and calanois copepods. Kraul has much experience with raising ornamentals. 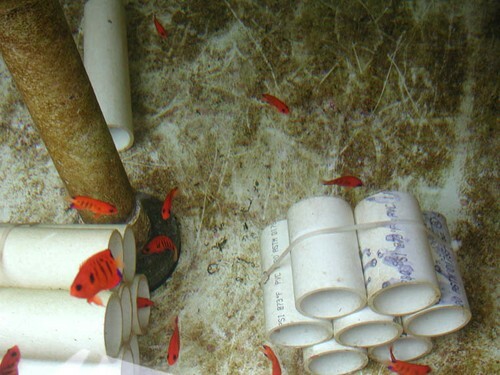 He has had partial success raising butterfly fish, centropyge angels, scorpionfish, triggerfish and other fish through the first feeding stage. In fact, yellow tang larvae were kept alive for 40 days. Still, the project is in the early stage of research and development and Kraul is unsure when the fish will be available to be sold commercially. Another recent front page story in West Hawaii Today concerned an ongoing aquaculture success at the Energy Lab. The previously almost secretive owners of Ocean Rider Inc., aquaculture producers and exporters of a number of seahorse species adapted to frozen food diets, has opened its doors to visitors. The announcement, “Visitor Center Opened” contained the following, “You have been asking us for tours and to get a glimpse of where the little critters are born and raised. We are pleased to announce that the Ocean Rider facilities are now open for tours to the general public.” See their web site for details at http://www.oceanrider.com. There are some interesting photos here as well: http://seahorse.com/component/option,com_gallery/Itemid,31/. It’s another great reason for a trip to the Big Island of Hawaii. While you’re there come and visit me at NELHA’s outdoor exhibit area, where we have live displays of many of the organisms, both food and ornamental, that are aquacultured here.